My question always is when reading a recipe is what is the difference between confectioners sugar and powdered sugar. Why do all recipes call it the first and not the second? As you already know, confectioners’ sugar and powdered sugar are the same thing – there is no difference. This sugar is also sometimes also called 10X sugar. 10X sugar refers to the number of time the sugar is processed to produce fine powder. I believe it is a regional thing on which sugar term is used in recipes. In the northwest, where I live, we call it powdered sugar and use that term in our recipes. I noticed that most of the southern cookbooks call it confectioners’ sugar. In Canada and England, it is called icing sugar. It is no different than the terms used for butter. On the west coast, that is where I am from, we say cubes of butter. On the east coast they say sticks of butter. There are probably a lot more cooking terms that are used regionally, but that is all I could think of right now. Mix 1 cup granulated sugar and 1 tablespoon cornstarch in a blender at high speed for several minutes. As with most substitutes, the consistency and texture of the dish may be altered. 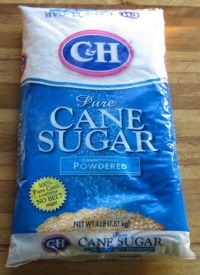 If at all possible, take the time to purchase and use the sugar asked for in your recipe. One (1) gram of sugar, like that of any other carbohydrate, provides 4 calories in a person’s daily diet. Sugar is converted immediately into the fuels a body needs. Study after study shows that restricting foods or food ingredients won’t work. In fact, it can create a forbidden fruit syndrome that causes individuals to gain weight. Sugar plays a role in helping suppress feelings of hunger, a plus for those striving to control their weight. Remember – One (1) teaspoon of sugar has 15 calories. One (1) gram of fat, on the other hand, deliver 9 calories. Fats are stored for later use. Energy from fat cell reserves is released only when other sources are not available. People gain weight when they take in more calories than they burn. So, if you are concerned about your weight, eat reasonable amounts, drink plenty of water, and maintain an appropriate level of physical activity. Sugar is a safe food that can easily be included in healthful eating. People should limit their sugar intake to no more than 10 per cent of their daily diet. Artificial Sweeteners – Many people use artificial sweeteners because they think they are cutting calories and will lose weight. Often, these people will eat artificially sweetened foods or drinks and then eat even more of other foods. They may even end up gaining weight! The calorie savings with artificial sweeteners are not as great as most people think. Also remember, artificial sweeteners are not found in nature. Just a little aside for you – I just read your Q & A on Icing/Confectioners sugar. When I lived in Lancaster, PA, my Amish (and other) neighbors kept talking about 10X sugar. It turned out to be the name they used for confectioners sugar. My Amish friend used to buy milk crumbs as well to make cup cheese. This term certainly took me for a loop Turns out, what she was referring to was very dry, large curd cottage cheese. Great site – I really enjoy it. Your information about sugar versus fat is not accurate. Sugar consumption actually increases hunger feelings and cravings. Fat actually satiates the body and is essential for proper functioning in your body, especially your brain. Please look at the newer research on this, especially how the sugar industry shaped the nutritional recommendations in this country decades ago, and we are now facing the consequences. Actually, you’re both right/wrong. Fructose, which is a type of sugar, in shown in studies to increase appetite and food intake. Glucose, another form of sugar, does NOT increase appetite. So, what’s the difference? Fructose is generally found as a food additive and includes refined table sugar and high-fructose corn syrup (common food/drink additive). Glucose is naturally occuring in things, such a fruit. Does this mean I should avoid adding sugar to foods or use artificial sweeteners? No. Proper brain function depends on sugar. 1/2 of your sugar intake is used for energy in the brain. Too much, however, can hurt brain function. So, as with most things, moderation is best, NOT elimination. Umm…actually, fructose is found in fruit and honey. Sucrose is table sugar. Glucose is the form of sugar that our bodies burn for energy. They are all sugar. Whatever type you eat (or any other food, for that matter), your body must convert it to glucose in order to burn it for energy. The problem is “sugar” is a scientific term for an entire family of chemicals. Artificial sweeteners are in fact sugars but the body has no way to digest them. We’re unsure what happens when they hit your gut though. There could be whole families of gut bacteria that feed on artificial sweeteners. That could be good or bad depending on your intake. Glucose is the sugar which the human body uses. We have a way to survive without it but our body will produce it in all but extreme scenarios. Fructose is a sugar that plants often produce. Sucrose is table sugar. It’s simply glucose bonded to fructose. As soon as it gets into your body it is quickly and easily split into fructose and glucose. It’s best to just consider that anything “sugary” is a mostly even split between the two. High fructose corn syrup is made artificially but it still ends up as fructose and glucose in your body. It’s important to note that the human body can not use fructose. The liver runs it through a process similar to alcohol and converts it then stores it. This process has some by products like uric acid which can build up and cause other problems. The other scary problem is the liver simply can’t use all this energy it’s storing. The end result is non alcoholic fatty liver disease. On the other side all that glucose you’re ingesting is forcing your body to release a lot of insulin. If you’re overweight or have other risk factors you quickly become insulin resistant. This means you must produce more insulin and possibly damage your ability to produce insulin. The common end result is diabetes. This doesn’t mean sugar is the devil of course. It has benefits but only in moderation. If you’re going to eat fudge make sure you don’t gorge on it and avoid other sugars the rest of the day. what the different between castor sugar and confectioner sugar ? Check out What’s Cooking America’s column on Types of Sugar. Powdered sugar and confectioners sugar are not the same. Confectioners sugar is powdered sugar that has had an anticaking additive (usually corn starch) added to it. The body does not take the fat you eat and the sugar you eat and pack it away like a mouse as it arrived, so your analogy is wrong. Both are broken down by the intercellular Kreb’s cycle. Please read up on this so you pass along correct information to your readers. Fat takes additional energy to break down while sugar does not.